These statistics that are included in CIC annual report will be made public next month. Over a decade after the implementation of the Right to Information (RTI) Act, the government has finally fallen in line. 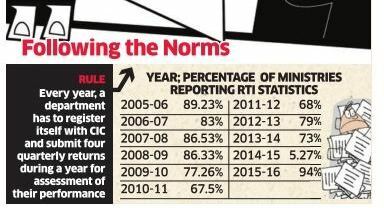 After refusing to divulge statistics on RTI applications for years, a record 94% of central ministries and departments have followed the rulebook in 2015-16, the Central Information Commission (CIC) has revealed. According to statistics collated by the CIC, the final appellate authority under RTI Act, 94% of the public authorities have reported in 2015-16 on how they have been implementing the RTI Act. These statistics are included in CIC's annual report of 2015-16, which would be made public next month. This is the first time that the number of public authorities following the rulebook has crossed the 90%-mark. Every year, a department has to register itself with the CIC and submit four quarterly returns during a year for assessment of their performance. These returns include the number of applications received, disposed of, applications rejected, grounds of rejection, number of first appeals filed and the pendency at each ministry . This reflects on the efficacy of the RTI system in the government. So far, the number of ministries which have reported on the implementation has declined steadily . In the first year of the implementation of RTI Act 2005-06, the most number of public authorities had reported their implementation figures. In that year, 89.23% of the public authorities had submitted the statistics. This has declined to an all-time low of 67.5% in 2010-11. It became a shade better last year when 75.27% of the ministries and departments submitted their quarterly returns. The number has increased after concerted efforts by the CIC, which put in place a system to ensure all public authorities registered and reported their statistics.